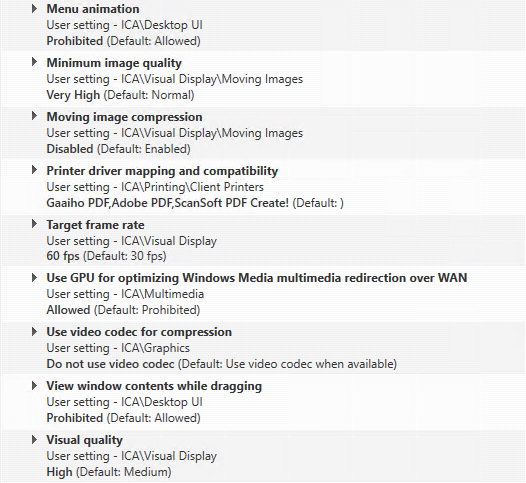 Citrix XenDesktop HDX 3D PRO Citrix Policy Setting For Optimizing User Experience. 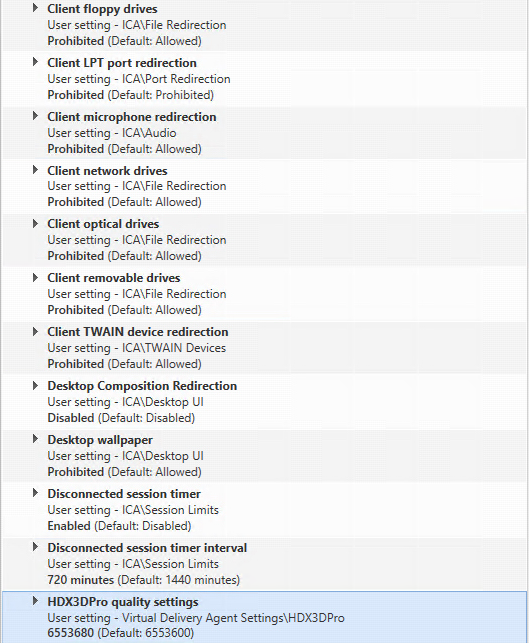 Here’s the Citrix policies that we have configure for out XenDesktop 3D Pro virtual machines. We went through several weeks of testing different settings with real CAD users working out of branch office locations. During the testing we were monitoring the VMware hosts, Nvidia K2 GPUs, virtual machines and network while the users attempted to use CAD programs. These users were doing side by side comparison testing with VDI and their local workstation. Our main reason for moving to XenDesktop HDX 3D Pro was to eliminate the need to buy high performance workstations so we had the challenge of making XenDesktop perform as well as their local workstations. If your network connection does not have enough speed and bandwidth available or you have high latency you will not be able to successfully replace a local workstation running AutoCad, Catia, or any other cad/GPU intensive application for a XenDesktop HDX3D Pro virtual machine. Most of our users are advanced CAD users so their expectations are higher than a lot of standard users but this was our general consensus based on end user feedback, performance data that we gathered during testing. These policies were applied when we were running XenDesktop 7.7 and haven’t changed after upgrading the VDA and XD Site to 7.9.